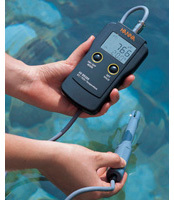 The new waterproof Combo testers from Hanna are designed for high accuracy pH, EC/TDS and temperature measurements. 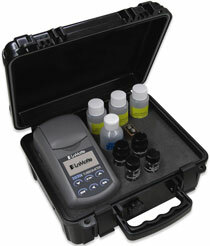 No more switching meters to measure the pH and then the EC or TDS of a solution. 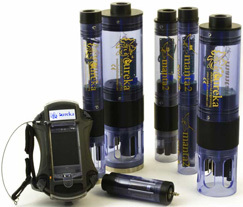 The versatility of the Analite 160 Handheld Turbidity Meter is unsurpassed. 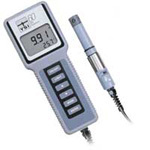 The backlit 2 line alphanumeric LCD display allows the user to view 0.5 second updated readings, and store them in a 100 reading memory, as well as set up measurement parameters through a user-friendly menu system. 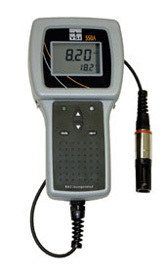 HI 9146 D/O Meter measures dissolved oxygen in mg/L, percent saturation and temperature to depths up to 50 meters. The meter has automatic calibration and temperature compensation (ATC), as well as, manual compensation for altitude and salinity. The temperature range is indicated in Celsius from 0 to 50°C with 0.1 resolution. The polarographic D/O sensor is housed in a protective probe guard, and is available with 4, 10, 20, 30, 40 or 50 meters of cable. 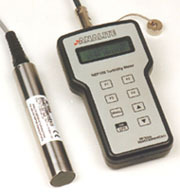 The new OxyGuard Handy Polaris Portable Dissolved Oxygen (D/O) Meter measures %saturation, mg/L (ppm) and temperature. Designed for ease of use and quick start-up, measurements are compensated for temperature, barometric pressure and salinity. Also the Polaris includes "On-screen" instructions, as well as automatic calibration with stability check of meter, cable and probe. 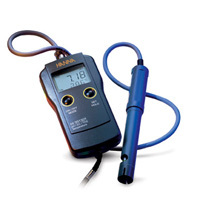 The YSI 60 measures pH and temperature at depths up to 100 feet. The rugged pH electrode is field replaceable and has an industry-leading one year warranty. The YSI 60 features automatic push-button calibration, low-battery indicator & automatic temperature compensation (ATC). 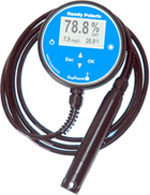 pH and temperature readings can be viewed on the bright, backlit display or stored in a 50 reading memory.